The concrete Pantheon in Rome is in excellent condition after 2,000 years. Steel reinforcement can dramatically reduce lifespan of concrete structures however and deterioration can begin after only 10 years. Infrastructures such as bridges and roads are usually reinforced concrete, which need continuous monitoring for regular operation and safety. Large concrete structures pose various challenges mainly due to the wide range of aggregates, fragments compacted together, in the material. NDT is one of the most effective ways for inspecting such concrete structures. The partly EU-funded COBRI project has developed an easy and efficient system that is also low-cost and portable. As Philippe Olivier, CEO of ELOP AS, the company that coordinates COBRI explains "The main technological breakthrough is a new design for capturing real time ultrasound data from concrete structures and presenting this data in a human readable 3-D video format." The ultrasonic rolling scanner also incorporates a host of other features. It's high speed and scans at 10 cm/s to 100 cm/s depending on the resolution. Depth of penetration has been increased from 15 cm up to 50 cm. Resolution of around 1 cm can detect rebar, short for reinforcing bar, and separation of the material into layers as well as cracks. There were challenges on the way and development of the prototype was more demanding than expected. Handling of different waveforms and scattering from aggregates required much extra research and time-consuming experiments. A field test had been performed with Ramboll, a highly qualified company in bridge inspection and NDT. ELOP collaborated with partners such as TOPRO, Aurotech Ultrasound AS, COWI and RAMBOL to fulfil this project. COBRI finished at the end of 2017 and has ambitious plans for extending technological features and introduction to the marketplace. Optimisation of signal processing will result in discrimination between the different materials – steel, air and water – in the visualisation. In parallel to this, the industrialisation of the scanner will be completed and the company will also build up the sales force and start production. For larger horizontal areas, a trolley version using the same basic rollers is under design. The terrain for inspection isn't always flat and structures such as dams, pillars and silos require time and cost-guzzling scaffolding for access. 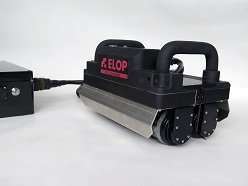 The answer is the rolling scanner connected to robots or crawlers. Based on the same rolling principle for fast secure capture of ultrasound data, the team are planning to address a new market. Using higher frequencies, new broadband scanners can be used on composite materials and metal. Also, non-destructive target structures could be windmill blades, welding inspection, tanks and ship hulls and this is being explored via the spin-off project Multrawheel. "Impact doesn't end with detecting problems in reinforced concrete structures although early proactive detection of corrosion, crack and delamination could lead to savings of billions of euro worldwide," Olivier emphasises. The user value chain includes constructors, inspection consultants and NDT service providers to the bridge owners. Moreover, the scanner requires less specialist training than systems in current use and data can be transferred to a central site where it can be analysed by experts. Environmental benefits include reductions in energy consumption for cement production and demolition waste. Cuts in traffic delays mean less fuel consumed together with less associated noise and air pollution. Summing up the success of the project, "We provide a low-cost solution for easy and efficient NDT of concrete structures," Olivier says. Referring to impact on road infrastructure, he adds "This innovative solution will simplify and improve current bridge inspection methods and consequently improve safety, enhance capital investments and road infrastructure capacity." Reinforced concrete buildings are pre-stressed by tensioning the concrete rods. This saves considerably on the quantity of concrete but it means that the tension must remain all of the life of the building. So the testing that is required is to measure the tension or the resulting compression in the concrete itself. When a crack develops in what should be a compression side of a concrete beam, we know there is a weakness already being formed.